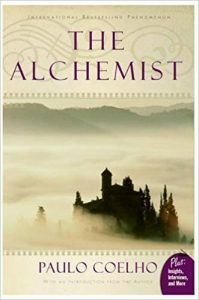 The Alchemist is the magical story of Santiago, an Andalusian shepherd boy who yearns to travel in search of a worldly treasure as extravagant as any ever found. From his home in Spain, he journeys to the markets of Tangiers and across the Egyptian desert to a fateful encounter with the alchemist. The story of the treasures Santiago finds along the way teaches us, as only a few stories have done, about the essential wisdom of listening to our hearts, learning to read the omens strewn along life's path, and, above all, following our dreams. If you enjoy the inspiration The Alchemist provides, check out the following suggestions. The narrator of this extraordinary tale is a man in search of truth. He answers an ad in a local newspaper from a teacher looking for serious pupils, only to find himself alone in an abandoned office with a full-grown gorilla who is nibbling delicately on a slender branch. "You are the teacher?" he asks incredulously. "I am the teacher," the gorilla replies. Ishmael is a creature of immense wisdom and he has a story to tell, one that no other human being has ever heard. It is a story that extends backward and forward over the lifespan of the earth from the birth of time to a future there is still time save. Like all great teachers, Ishmael refuses to make the lesson easy; he demands the final illumination to come from within ourselves. Is it man's destiny to rule the world? Or is it a higher destiny possible for him—one more wonderful than he has ever imagined? Fragments of a Great Secret have been found in the oral traditions, in literature, in religions and philosophies throughout the centuries. For the first time, all the pieces of The Secret come together in an incredible revelation that will be life-transforming for all who experience it. In this book, you'll learn how to use The Secret in every aspect of your life - money, health, relationships, happiness, and in every interaction you have in the world. You'll begin to understand the hidden, untapped power that's within you, and this revelation can bring joy to every aspect of your life. Chronicles the spiritual evolution of a man living in India at the time of the Buddha. A narration of a summer motorcycle trip undertaken by a father and his son, this book becomes a personal and philosophical odyssey into fundamental questions on how to live. The narrator's relationship with his son leads to a powerful self-reckoning; the craft of motorcycle maintenance leads to an austerely beautiful process for reconciling science, religion, and humanism. Resonant with the confusions of existence, this classic is a touching and transcendent book of life. View more suggestions for Paul Coelho's The Alchemist.